All the Light We Cannot See, by Anthony Doerr, is a novel I probably never would have picked up had it not come to me as a gift from my daughter Sara, whom I am ever hounding to read the many books I send her way. So it was with a certain sense of obligation that I took this heavy volume out to my deck on a recent sunny Saturday morning with a cup of coffee and turned to chapter one. It was dusk on the next day with an emptying bottle of beer in the fading crepuscular light when I finished it. In between, I did little else but read this book, a complex work of literary fiction that runs well over five hundred pages yet is so compelling and so well-written that it seems impossible to let it go. I cannot recall the last time a book of this merit and intricacy has gripped me with such force, literally from cover-to-cover. 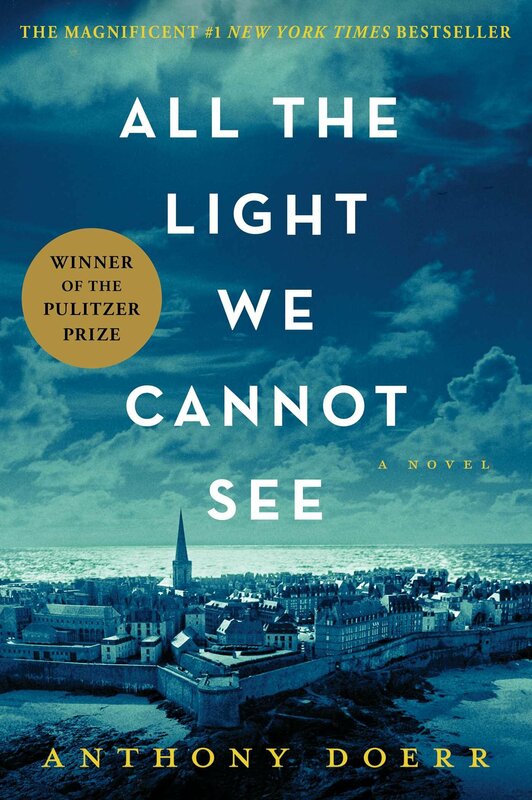 No wonder that All the Light We Cannot See was the winner of both the 2015 Pulitzer Prize for fiction and the 2015 Carnegie Medal for Excellence in Fiction, as well as other prestigious awards. Doerr, an otherwise little-known author, has written a dazzling multifaceted masterpiece that cannot adequately be described or deconstructed in a review format. The premise of the storyline sounds simple and perhaps so sentimental that it might make the potential reader turn away: the lives of a blind teenaged French girl and a brilliant young orphaned German soldier intersect in unlikely circumstances during the tumultuous liberation of World War II German-occupied France. But there is virtually nothing simple or sentimental in this multilayered narrative that in a microcosm manages to trace the growth of fascism in Depression-era Germany, explores the art of the locksmith, the science of electromagnetic waves, the evolution of mollusks, the construction of a radio from spare parts, the literature of Jules Verne (in Braille! ), the methods of a small-town French Resistance cell, the architecture of a medieval city, the perils of combat on the Russian front – and even includes as its central character a legendary and priceless diamond that could possibly bestow upon its owner both a unique blessing and a terrible curse. There is so much to extol about this extraordinary book! What appears to be an obvious metaphor in the title turns out to be a wide panoply of allegory embedded in the narrative structure of the tale, but – in a testament to the craft of the writer – much of it is hardly evident until the closing stages of the work. All of the characters are exceedingly well-drawn with a sophisticated dimensionality not weighed down by unnecessary detail. And the prose – well this is the shining glory of it all because Doerr writes so well that the complicated architecture of the novel never slows down the pace, so paragraphs and chapters can be gulped down by the reader as if it was pulp, which it most certainly is not. In this and in many ways I am reminded of Hemingway, although the author’s voice could not be more different in its expression. Hemingway too used complex literary techniques like the objective correlative, but these were often only palpable for the reader on reflection and never slowed the narrative down. Like Hemingway, there is not a single extraneous bit of information in the entire novel: Doerr imparts only and exactly what you need to know, about the characters, about the place and time, about the plot. Thus Doerr takes apart and rebuilds a radio the way Hemingway would a rifle, not only to add veracity to the tale but because it is essential to the story. This novel truly is almost perfect. The only fault I could find is with the protagonist’s agoraphobic great-uncle, who strikes me as perhaps just a bit too old to be a veteran of the Great War in his youth as portrayed. But this is such a minor quibble that it is perhaps hardly worth mentioning, except by way of illustrating that only in such nitpicks can we locate flaws, and even these are so minor as to barely warrant attention. I highly recommend this superlative novel to every audience. This man is on my Facebook page is soooo well read it’s unbelievable! He has individual bookshelves full of genre he loves, American history, chinese history, you name it, he reads it. Enjoy! This review is amazing Stan! I don’t think I’ve ever read any reviews that is in-depth and in detail like yours! There’s no way I’m gonna ever reach to your level in writing review like this. Lol. At least not anytime soon. =D I don’t know when will I start reading this, the size is very intimidating! But excited to start it hopefully within this year! Thanks again! Thanks for the kind feedback on the review! The novel, despite its intimidating size, turns out to be a pretty fast read once you get into it. I more or less inhaled it … LOL Let me know what you think when you get around to it.